The US Continues Push for World Cup Soccer! The United States will face El Salvador on Feb. 24 in Tampa, Fla., in their second-to-last match before naming the roster for the 2010 FIFA World Cup. Kickoff at Raymond James Stadium is set for 7pm, and the match will be broadcast live on ESPN Classic and TeleFutura. Fans can also follow the match live online via ussoccer.com’s MatchTracker or twitter.com/ussoccer. Tickets ranging in price levels from $18 to $68, plus special VIP On-Field Seats for $150, go on sale to the public Thursday, Jan. 21, at 10 a.m. ET through ussoccer.com, by phone at 1-800-745-3000 and at all Ticketmaster ticket centers throughout the Tampa Bay area (including many FYE stores). Groups of 20 or more can obtain an order form at ussoccer.com or call 312-528-1290. Ultimate Fan Tickets (special VIP packages which include a premium ticket, a custom made official U.S. national team jersey with name and number, VIP access to the field before and after the game, and other unique benefits) are also available exclusively through ussoccer.com. As a sponsor of U.S. Soccer, Visa® is pleased to offer all Visa cardholders access to an advance ticket sale for this match before the sale to the general public. This advance sale starts tomorrow, Jan. 20, at 8am and runs until Thursday, Jan. 21, at 8 a.m. at ussoccer.com. Visa will be the only payment method accepted through the Visa presale and is the preferred card of U.S. Soccer. Terms and conditions apply. 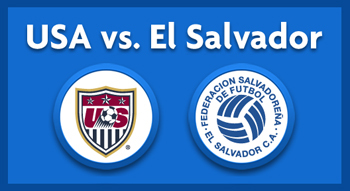 The United States is 14-1-5 all-time versus El Salvador, with 45 goals scored and 13 surrendered. The only loss came Feb. 19, 1992, in a friendly in San Salvador. The teams last met during the final round of 2010 FIFA World Cup qualifying, with Clint Dempsey and Jozy Altidore scoring to earn a 2-1 come-from-behind victory on Sept. 5, 2009, in Sandy, Utah. El Salvador was one of the surprise teams in the CONCACAF region during 2010 qualifying, making it to the final round for the first time in 12 years and beating both Mexico and Costa Rica in San Salvador in 2009. So, why is this a big deal you ask...well, in case you havent&apos; heard, Tampa, one of 18 cities that will be included in the USA’s bid to host the FIFA World Cup in 2018 or 2022, will be hosting the U.S. team for the fifth time. In the last visit, Landon Donovan recorded the second hat trick of his career in front of a record-setting crowd for a friendly in the state of Florida as the U.S. cruised to a 3-1 victory on March 25, 2007, against Ecuador at Raymond James Stadium. The U.S. has a 2-1-1 record in Tampa, with the other win coming in 1990 against Finland. Following the match against El Salvador, the U.S. will travel to face the third-ranked Netherlands on March 3 in Amsterdam. Kickoff at the Amsterdam ArenA is set for 8:30 p.m. local time (2:30 p.m. ET), and the match will be broadcast live on ESPN2 and TeleFutura. The match falls on the only international fixture date before the start of the tournament in South Africa, and will be the USA’s final game before naming the World Cup roster in early May. So, hosting this game is a great thing for Tampa Bay. Make sure you head out and enjoy in the festivities!!! And as always, keep checking back for more great things to do in Tampa Bay and awesome Tampa Bay area events.